Here at All Nations we are interested in finding valuable information about mission. Journals and articles are a great source for keeping up to date. Below you can find some of the latest articles on mission that you should know about. Some of these articles can be found in the All Nations library and others are available on the web. Early 20th century evangelical mission organisations that emerged from the British Holiness Movement prioritised evangelism over social reform. Female missionaries, however, were often engaged in bringing social transformation. Even though women were the major workforce in overseas mission, leadership was always in male hands. 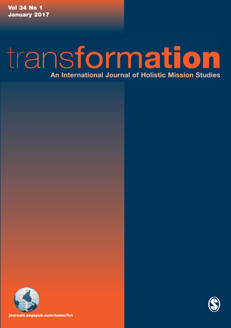 This article discusses how even though women in the Japan Evangelistic Band were not in leadership positions, their initiative in social engagement enabled the Mission to participate in spiritual as well as social transformation, and raise a generation of Japanese female leadership. Peace and reconciliation are vital theological concepts: God reconciles himself with us through Christ, and likewise, we are called to become reconciled with one another. But how can this theological understanding be applied to peace and reconciliation between the two Koreas? I discuss here some of the theological efforts that have emerged, drawn from (1) Korean experiences of captivity to ideological differences, (2) distrust and despair, and (3) differing identities between North and South. If Christian theology is to address these issues, we must explore further the meaning of the key concepts Jubilee, han, and shared identity. To become a library member click here.